My name is Corrine Sawatzky and I live in Southern Manitoba with my human family and Shih Tzu family. All of my dogs have free run of my home. I do not run a Kennel operation. 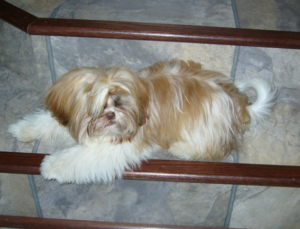 I am a small Hobby breeder of quality CKC Shih Tzus. My puppies are raised around everyday household sounds and around children. My Grandchildren are over to play with the babies once they are old enough to play. My puppies leave my home well socialized happy shih Tzu babies. They will are vet checked ,dewormed 3 times, receive their first set of vaccinations, with pee pad training started, puppy pack, 6 weeks of free pet insurance, micro chipped and a health guarantee. If you are interested in a puppy, please fill in our puppy application. You will be contacted after I receive the application. If you have any questions, please feel free in emailing me at casca1@mymts.net or visit our contact page to fill out our online contact form. From time to time I produce these rare colours. If your looking for a rare color such as blue or liver, please contact me. I will also have golds, gold and white,blacks ,black and white, all the standard Dhih Tzu colors . I make no promises in regards to Size at Maturity. Standard CKC shihtzu ranges from 9lbs to 16 lbs. Please take a look at the rest of my site as you will find a lot of interesting info! Our puppies are vet checked, healthy and have dewclaws removed. Our puppies have been dewormed @ 3,5,7weeks of age. Our puppies do not leave our home until they are at least 8 weeks. Our puppies are guaranteed in writing and sold with a puppy sales contract. We give friendly pre and after adoption advice. Our puppies come with Vet health record/vaccination certificate, tattooed or micro chipped. We are there for the planned breedings and puppy whelping to insure the best possible care is given to both the dogs and their offspring. I personaly open every sac cut ever cord and suction each puppy at least 2 to 3 times .They are then dried off and given back to the mother. Our dogs are housed in our home not cages. Our dogs are healthy, current on all vaccinations, on heartworm prevention programs not over bred and vet checked at least twice yearly. Our dogs/puppies are feed premium high quality dog/puppy food and treats. Our dogs/puppies are always kept in a clean enviroment. Our dogs are first and foremost our pets/companions and not just breeders. Our dogs/puppies are kept busy with toys and are well stimulated. Our dogs/puppies have excellent veterinary care. Our puppies are kept on a heating pad until they are 2 weeks old and can regulate their own body temperature. Our puppies are also kept on a mattress that isnt flat with stuffed toys available to snuggle up on not a flat surface to prevent swimmer puppies.